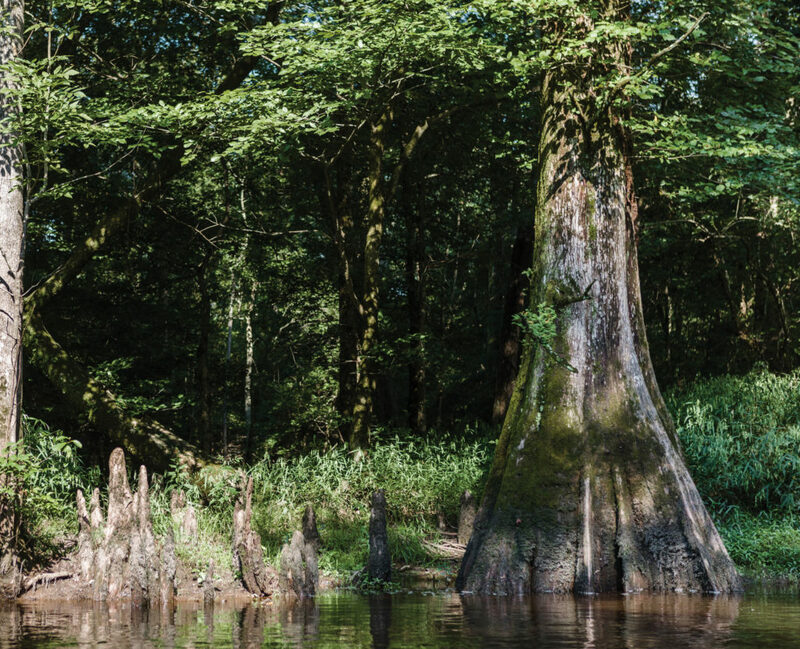 Paddling down Swift Creek affords peerless views of flora and fauna — and multiple opportunities to carry your canoe over fallen trees. The deer came out of nowhere. I made a near-hairpin turn in the stream, hugging the canoe tight to the bank, underneath a towering palisade of beech and mountain laurel. In a hidden world such as this, I try to stay hidden in the shadows as well. Muscadine vines trailed the water like knotty fingers, hiding wood ducks under holly branches, but my eyes were drawn downstream. Something was swimming in the water ahead. I peered hard, trying to make sense of the shape. Then sunlight glinted from an antler. It was a buck — a six-point buck, as I’d soon discover — and I followed the deer for its 100-yard swim down the creek. The buck was calm and relaxed, stroking like a happy kid in a pond. He stepped from the creek and shook the water from his hide, bent down for a drink, then vaulted over the stream bank and vanished into the dark woods. I’d never seen such a thing, a deer cooling its hooves on a hot afternoon. And he seemed entirely unaffected by my presence on the water. In fact, I suspect the buck was as surprised to see me as I was to see him: In a sense, I had appeared out of nowhere, too. Look at a detailed map of practically anywhere in North Carolina, and you’ll find a webbing of smallish blue lines that vein the landscape. These pint-size waterways wind through forest and farm country, swamp and beaver sloughs, in every corner of the state. You drive over them on your way to the beach, to the lake, to the mountains, dark slashes of quiet water that wink at you during the two seconds it takes to cross some back-road bridge. For me, those winks are seductive, for down those creeks lie untrammeled, unvisited worlds that don’t require much more than a canoe, some bug dope, and a little muscle and sweat to explore. This stream, Swift Creek, snaked un-swiftly through the hardwood bottoms of eastern North Carolina — in some places, the creek wasn’t as wide as my canoe is long. I’d dragged the boat down the bridge embankment and, admittedly, wondered what I was getting myself into. Trash littered the woods. But I’ve learned that although you might carry the canoe through 40 yards of woods soiled with sofas, cinder blocks, and bags of trash tossed from the bridge, 10 paddle strokes away from the ugly side of human nature lies the resilience of nature itself: A canopy of tall river birch, sweetgum, and swamp chestnut oaks shaded my passage. Cypress trees and cypress knees lined up like ancient fence lines along the bank. Snakes dripped from the trees, and turtles plopped into the cool stream. Ten more paddle strokes and I was in another world, the road behind forgotten, the water ahead calling to all my senses: the lilt of a Louisiana waterthrush, the sight of a beaver dam cluttered in a tributary, the beguiling scent of mud. After my synchronized swimming, of sorts, with the six-pointer, I slowed my paddling to a more relaxed refrain. Like a kineograph, the old-timey flip-books that you fan with a finger so that each slightly altered static scene seems alive with cinematic motion, each paddle stroke revealed a slightly different view of muddy banks pocked with raccoon and opossum tracks, peeling sycamore trunks with gnome-like faces, the long lane of Swift Creek arrowing through the forest. If I squinted just right, I could see the 18th century. Their small size and seeming ubiquity may lead some to believe that these diminutive waterways are unimportant, but these are vital resources. They refresh larger waters that serve as the sources for human consumption. They provide a home for a bewildering array of wildlife. Along Swift Creek’s upper stretches — designated an Outstanding Resource Water by the state — you can find 10 state and federally listed rare, threatened, and endangered species, part of a trove of more than 50 fish species, 16 freshwater mussel species, and seven crayfish species. Yet the low water flows of small rivers and streams leave them vulnerable to pollution. They don’t have a voice of their own, except the voices of those who take the time to know them, and to speak on their behalf. I’ll admit, sometimes that voice sounds a bit like cursing. Three times during my five-hour paddle, I had to haul the canoe up and over fallen trees, a grunt-and-groan-filled process. I eased up gently, parallel to the tree, and carefully stepped out to the fallen trunk. Most times, I missed the otter poop. I straddled the tree, pushed the canoe perpendicular to the trunk, then hoisted it hand over hand up and over the obstacle. Not every creek requires this sort of backwoods Pilates. But every stream that does doles out dividends in solitude and wonder. I quickened my canoe stroke rate as the shadows lengthened. The end of the day is when I most want to be on the water, but at the end of a float, there’s still work to do. If I’m paddling with a buddy, we’ll run a two-car shuttle. If I’m paddling alone, I’ll have stashed a bicycle at the take-out bridge, and I’ll dash back to retrieve the truck, pedaling hard in mud-smeared river sandals. But all of that lay ahead, around another few banks, beyond a few hundred more paddle strokes. Blue sky flickered through the trees, marking the edge of a field. Tires rattled across the distant bridge. I wasn’t there yet, however. I wasn’t ready for the bright sky, the busyness, the to-do lists. I leaned to starboard, leaning into a wood thrush carol, leaning far over the water, and paddled. Another view of laureled banks and cream-soda sandbars. Another bend in the creek, and there was nothing particularly extraordinary about this one, either. Except for everything.